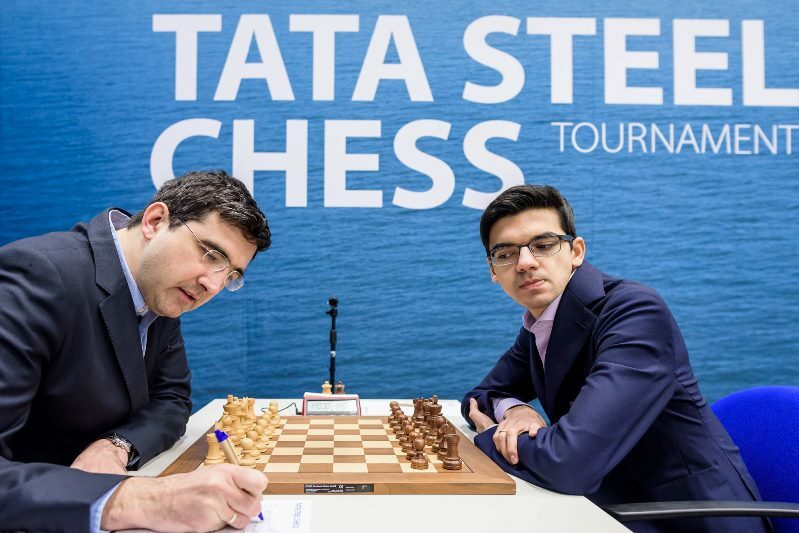 Anish Giri won his third game in a row against Vladimir Kramnik while Jorden van Foreest outplayed Jan-Krzysztof Duda in time trouble as the two Dutch representatives scored comeback wins in Round 2 of the Tata Steel Masters. 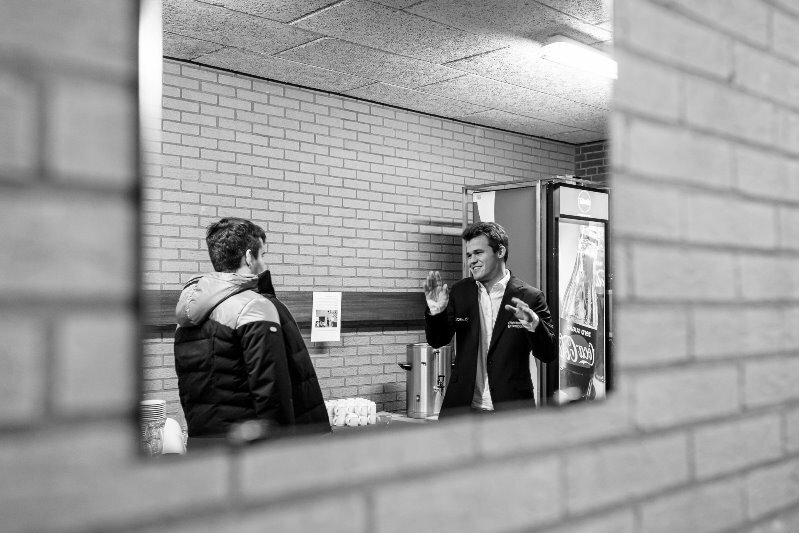 The other games were drawn, making it 19 classical draws in a row for Magnus Carlsen, who enjoyed what he called a “brief but exciting” sacrificial battle against Ian Nepomniachtchi. 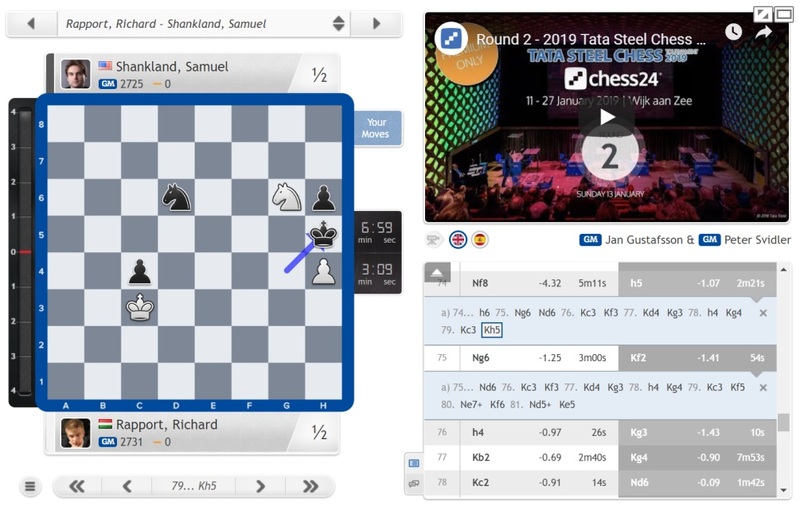 Sam Shankland once again came agonisingly close to a win, but was left to regret that pawns can’t move backwards at the end of a 7-hour struggle against Richard Rapport. 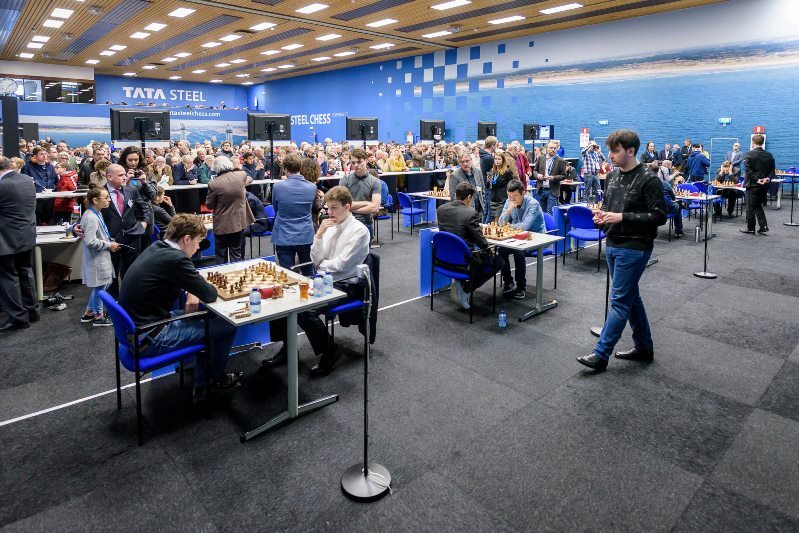 Our commentary duo of Jan Gustafsson and Peter Svidler stuck around to the bitter end! 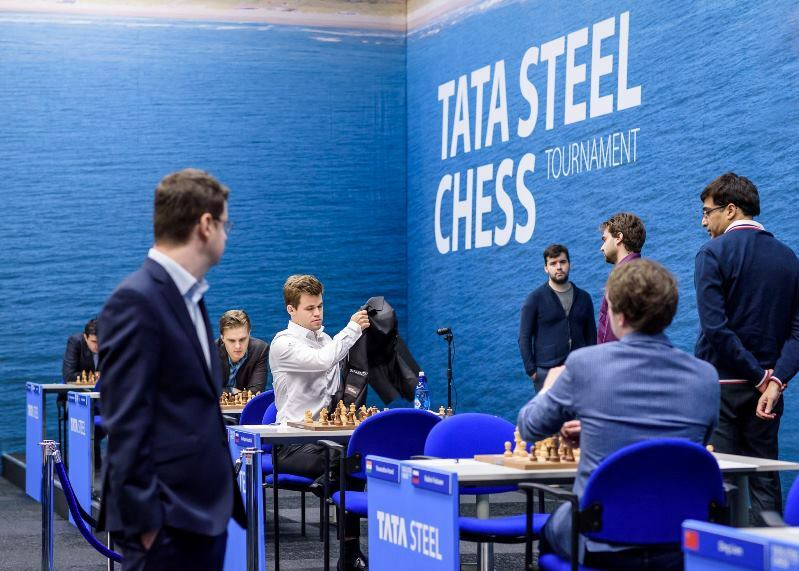 Go Premium to watch Jan and Peter live for all 13 rounds of Tata Steel. Now’s a great time to try it out as the voucher code TATA2019 will give you 30% off all subscriptions! 19.g3! would have upped the pressure on the black king, but instead Kramnik went for what Giri called a “very bad move”, 19.e5?! I was very happy when he played e5, because now already I saw the contours of this Petrosian exchange sacrifice, and I thought to myself that probably I’m going to lose anyway, but whereas yesterday I played like a drunk Tal today I’ll play like a drunk Petrosian - something to find some joy after losing two games. But then I didn’t even lose it, so I was very happy! The exchange sac appeared after 19…b6 20.Bf3 Ba6 21.Rf2 c5!? 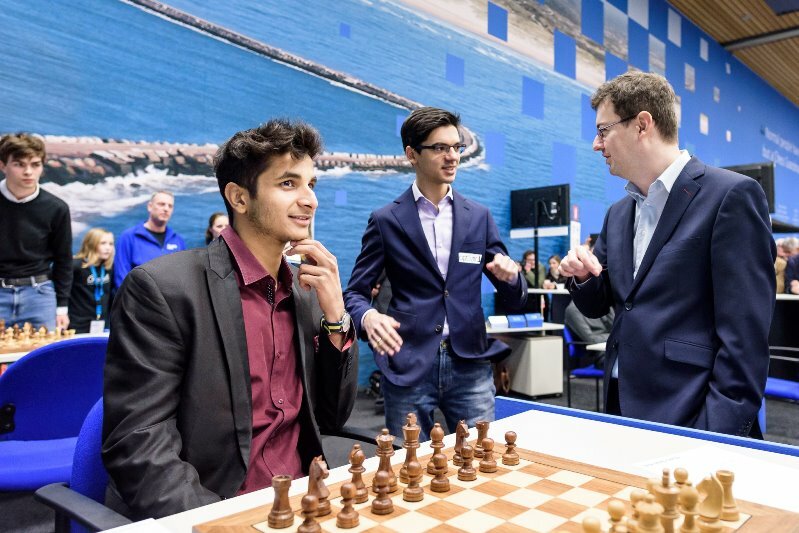 Giri, and the computers, think Kramnik should have taken the rook on a8, but instead he picked this moment to go 22.g3?, a move that should almost lose on the spot against 22…cxd4 or 22…Rc8. Giri instead played 22…fxg3! ?, admitting that was connected with a blunder. It seems he’d missed that after 23.Rxg3 cxd4 24.cxd4 if he now plays 24…Qxd4 there’s 25.e6! Instead after 24…Rc8 Kramnik once more burned his bridges with 25.Qf5?! As he saw me blundering one trick he was hoping I’d blunder another with Qxf7 and a very nice discovered checkmate, but usually after a player blunders one trick he gets the focus back and doesn’t want to blunder a second one. Black “blunders” White’s one idea of 31.Bf8, but in that case Black can simply give up his queen with 31…Rxf8 for a crushing position. Kramnik tried to play on with 31.Rd4, but his achievements for the rest of the game were limited to making it to the time control while playing on increment. He finally resigned on move 42, with a two pawn deficit the least of his worries. It’s quite remarkable, because I lost to him 7 games in a row, not counting the draws (there were not many draws, I pretty much lost 7 games in a row), and then I won the last 3, which was remarkable. I think it’s mostly to do with the fact that his level clearly dropped, and I sort of saw that as well. Basically today it was in his hands – he could have won it. Back in the day he would win it – he would go g3 instead of e5, but ok, it’s normal, people age and of course occasionally he’ll play a brilliant game, but overall his level probably dropped. 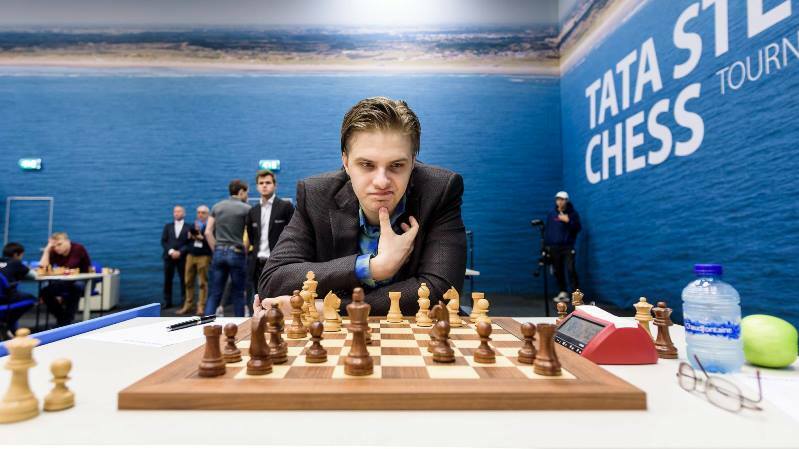 One player who certainly isn’t on the decline is 20-year-old Polish Grandmaster Jan-Krzysztof Duda, but on Sunday he fell to defeat against 19-year-old Jorden van Foreest. I thought I was much worse in the early middlegame, and then I got into time trouble, and somehow I survived. If the White pawn was already on g5 Jan-Krzysztof would be winning, but after 38…g5! Black is better everywhere. 39.Qh2 Nd2 40.Rc3 (accelerating the end) 40…Qa4! and the white cause was already hopeless, though resignation only finally came on move 50. Things are looking up for Jorden! It feels great and especially because it came so unexpectedly – I thought I would lose. How sure are we Duda wasn’t drinking beer on the job? 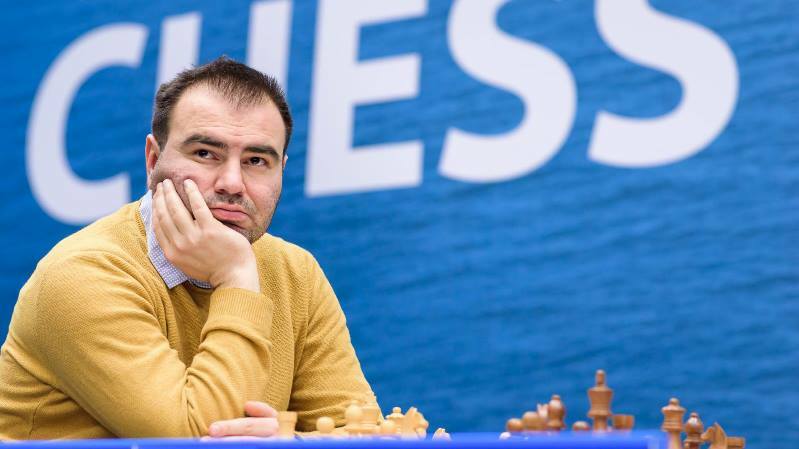 Mamedyarov-Radjabov ended in a 12th straight draw between the two Azerbaijan players, though at least on the outside it looked like an interesting tactical skirmish in the early middlegame before it fizzled out later. Peter explained the point of going for this ending with White is that Black would be fine if he controlled the b8-square, but since the bishop targets that square White can dream of a queenside pawn advance with moves such as a4, b4 and b5. Fedoseev’s 17…Rfc8 instead of Ivanchuk’s 17…Rfe8 was the first new move, but although the struggle was tense it was eventually agreed drawn on move 34 in a knight ending with equal pawns. The speed was the one thing that dampened the enthusiasm, however. Ian Nepomniachtchi said he hadn’t expected 1.d4 but he was still able to draw on some preparation he’d done for the f3-Grünfeld when he played it against Levon Aronian two years ago in the same venue. He remembered the key move 20…f5! First I was excited to see this idea of the rook sac, but then when he had 29…Rb8 I quickly calmed down and realised it was just a pretty dead-drawn position left. Black gives back a piece – 30.Rxb8 Rxb8 31.Bxf6 and after 31…Ra8 32.Nd1 the players shook hands. Ding Liren has his own record of 100 games unbeaten, and this year I already have my record of two games unbeaten, so that’s something, yeah? That leaves the game that kept our commentators busy for 7 hours and meant there was no time for a recap video: Rapport-Shankland. Up to a point the game was relatively symmetrical and standard, and then came 13.c4?! 50…Nxc4?! looks like punishment for pushing the c-pawn (although actually this is another c-pawn that started on b2! ), but the unexpected 51.Bf2! suddenly meant that Sam would have to win the game all over again, in a very tricky 3 vs. 2 knight ending. The difference with 74…h6! seems to be that the black king still has the h5-square and can break the fortress of a knight on g6 and a white pawn on h4 that we later saw in the game. After 6 hours of play that mistake was completely understandable, although you could certainly question the US star only allocating 2 of his remaining 25 minutes to such a crucial decision. In the game Black could only win the h4-pawn at the cost of giving up the pawn on c4, and Rapport had no difficulty in holding a 94-move, 7-hour draw. That’s already two missed chances in Wijk aan Zee for Sam, but he’s certainly making his opponents work! 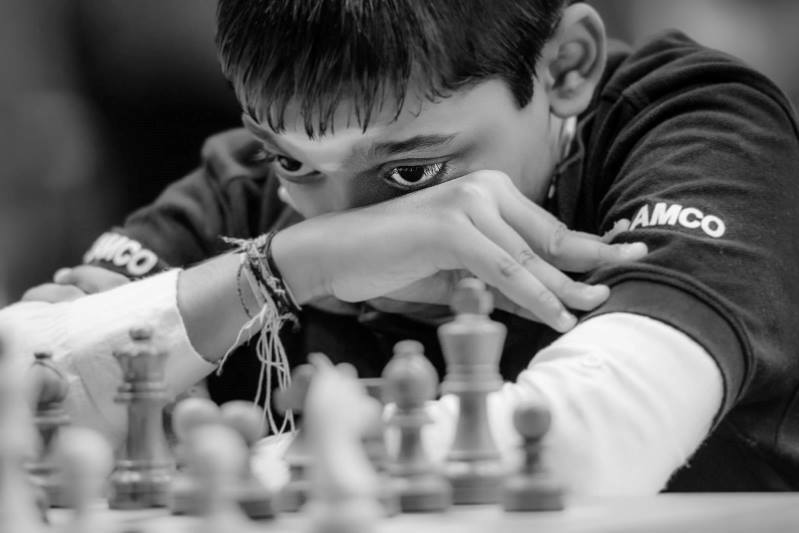 That was a surprise, since Praggnanandhaa and in particular Lucas van Foreest had to fight back from what looked hopeless positions against Vladislav Kovalev and Dinara Saduakassova. If the black king goes to a light square Parham will pick up material with check, and if it goes to a dark square he can finish in style with a knight fork – e.g. 56…Kg7 57.Qxd8! Qxd8 58.Ne6+. Instead Elisabeth resigned.